16 local wineries and more than 10 culinary partners are participating in the 7th annual Grape Arizona Wine Event, benefitting Phoenix Rotary Club Charities Youth Programs. 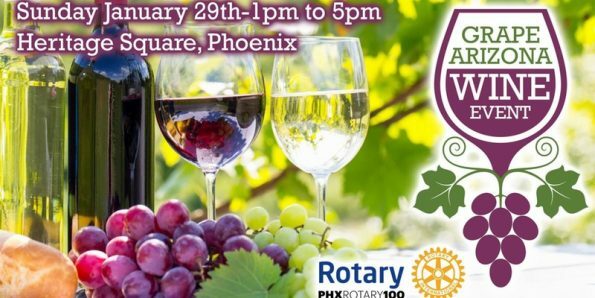 The Grape Arizona Wine Event will take place Sunday, Jan. 29 from 1:00 p.m.-5:00 p.m. at Heritage Square in downtown Phoenix. “This is a great opportunity for wine lovers to taste the best of what Arizona wineries have to offer — all in one place while supporting a great cause,” says Barbara Katz, the event’s co-chairperson. Discounted tickets are on sale now at www.grapearizonawineevent.com for $65 per person. Admission includes 20 wine tasting tickets, bites, and dishes from local area restaurants, a silent auction, a raffle featuring fabulous themed prizes worth thousands of dollars, and wine-related vendors. In addition to wine tasting, attendees will sample some of Arizona’s best food from culinary partners including: Beckett’s Table, The Bakery Phoenix, Leoni’s Focaccia, The Herb Box, The Larder at DeSoto Central Market, Modern Round, Southern Rail, The Strand, Urban Italian Eatery, Urban Table, Vincent’s and more! Wine lovers will also have a chance to purchase wine-related merchandise and other wares from various vendors. The Phoenix Rotary Club Charities supports initiatives including the Interact Service Club, The Rotary Youth Leadership Awards, and Rotary Youth Exchange. We will be giving away 3 pairs of tickets on Instagram starting this weekend! Be sure to follow Geeks Who Eat to be in the know and for a chance to win! Best of luck! For more information visit www.grapearizonawineevent.com.